Charles Eames is one of those wonderful and terrible figures of art and design history, and a symbol of both the productivity and the complacency of the American Fifties. This chatty little documentary isn't meant as an exposé, but Charles the man doesn't emerge from it as particularly admirable or even likable from the detailed picture he gets here (though he died in 1978, there is a great wealth of film footage of him). Handsome, stylish, but a bit stiff, he seems to wear a perpetual smirk that may reflect an uneasiness with people, and a sense of allofness. He was, we learn, an Alfa Male of the first order, and also not good at communicating in words. He was not altogether fair to the women in his life, dumping one for another, then ready to dump her for another yet, though the third woman ultimately declined to displace Eames' longtime wife and collaborator, Ray Kaiser Eames. Here we have a little picture of a big influence on style, on how people lived or pictured themselves living after the war and before kitsch and irony. Eames was from the Midwest. He and Ray met at Cranbrook Academy in Michigan. She was from Sacramento, and the couple moved their headquarters to Venice, California and it remained there from then on. Eames tended to take the lion's share of credit for the productions of his design office that included dozens of hard-working collaborators. Eames' wife Ray stood in the background, in Fifties style. In a filmed appearance with her husband, Arlene Francis tries to get Ray to take some credit for what was obviously an enormous contribution to the Eames studio's work, but she quietly but firmly shrinks from from doing so. 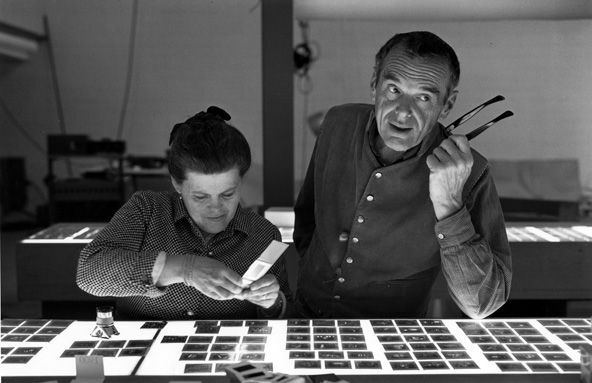 Now, however, the Wikipedia article is about "Charles and Ray Eames," and that is how we should think of them. Ray was a gifted designer in her own right, who had an eye for color and presentation that her husband quite lacked. She was first of all a painter who had studied with Hans Hoffman. She brought a more fully aesthetic and decorative, more visual quality to Charles' more bare bones structural, architectural, black-and-white designs. Eames was first of all an architect: the film's subtitle attempts, a little clumsily, to refer us to the separate achievements of husband and wife. Together they became designers for home and industry. After Charles' architectural training and practice came the molded plywood chair from which all else flowed, his permanent symbol. He partnered after the War with Eero Saarinen, using wood-bending methods first developed by Alvar Aalto. It began with splints for wounded men during World War II. The Eames chair, with its two curvy, somewhat leaf-like cups linked by a curvy branch, is the iconic Eames object, emblematic of midcentury American modernism. There were to be many chairs, tables, and objects, a whole cozy Fifties American modernistic look, a homegrown substitute and companion for the earlier, more austere and elegant and more geometric designs of the Bauhaus and the Russian avant-garde. Another slightly uneasy aspect of Eames is his willing participation in some of the more jingoistic Cold War propaganda of the Fifties and Sixties. He was, we learn, an important participant in the pavilion where the famous televised Nixon-Khruschev "Kitchen Debate" took place at the American National Exhibition in Moscow in July 1959. Eames contributed a clearly promotional -- and at the time innovative -- multi-screen film of America the Beautiful that was said to have brought tears to Khruschev's eyes. He was among other things a photographer and filmmaker and editor, and he might have liked to retire to do only those things. His short film "Powers of Ten" was another innovative piece. Later, he worked extensively with IBM and other big corporations, justifying this as the best way to get his (his office's) designs widely known and used. In short, he was a collaborator with big government and big business. And the designs were everywhere. As the New York Times review of this film says, "Their furniture filled houses, offices and airport terminals." When designs become that ubiquitous, do they mean anything any more? Does anyone even notice them? But I guess we have to see the Eames influence as positive. Better their designs than less pure and simple ones. A real revelation of the film is the house Charles and Ray lived in from the late Forties. It was designed and very rapidly built out of prefabricated industrial materials as part of the Arts & Architecture magazine's "Case Study" program, on a cliff overlooking the Pacific Ocean. It is clearly spectacular, a blend of the grand and the intimate, filled with the kind of personal object collections Ray's pack-rat tendencies fostered but also awesome and spacious -- and, the film notes, not plunked down in the middle of the most beautiful space but to one side, so the space can hold its own. Charles and Ray lived only for their work, and for their house. Except that Charles had a mistress, filmmaking collaborator and art historian Judith Wechsler, one of the many talking heads we hear from who give us other angles on this outwardly flat and unrevealing figure. Jason Cohn and Bill Jersey's Eames: The Architect and the Painter benefits from those interviews and from an extensive archive preserved at the Smithsonian. Narrated by James Franco and edited by Don Bernier with music by Michael Bacon, this First Run Features release is also a part of the PBS American Masters series. It was presented theatrically on two screens starting Nov. 18, 2011, including at the IFC Center in NYC, where it was screened for this review Jan. 1, 2012.